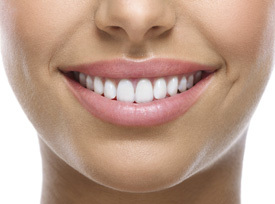 Dr Pohl uses veneers to create the appearance of beautiful white, straight teeth. Each veneer is a thin porcelain “shell” that is bonded to the front of a tooth, enhancing the way it looks when you smile. Patients are able to cover areas that cause them to be self-conscious and have a new smile in just a couple of visits. Diagnosis and treatment planning. This first step involves your active participation. At this appointment Dr Pohl will determine the result that you are trying to achieve and will examine your teeth to make sure dental veneers are appropriate for you and discuss what the procedure will involve and some of its limitations. Xrays and impressions of your teeth may be taken at this appointment for treatment planning. Preparation. To prepare a tooth for a veneer, Dr Pohl will remove about 1/2 millimeter of enamel from the tooth surface. An impression is taken which is sent to a dental laboratory that will fabricate the porcelain veneers. 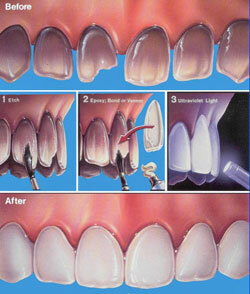 Temporary veneers are placed on the prepared teeth for the two weeks that it takes for the veneers to be made. Before the dental veneer is permanently cemented to your tooth, Dr Pohl will temporarily place it on your tooth to examine its fit and colour. Next, in order to prepare your tooth to receive the veneer, your tooth will be cleaned, polished, and etched — which roughens the tooth to allow for a strong bonding process. A special cement is applied to the veneer and the veneer is then placed on your tooth. Once properly position on the tooth, Dr Pohl will apply a special light to the dental veneer, which activates the cement, causing it to harden or cure very quickly. The final steps involve removing any excess cement, evaluating your bite and making any final adjustments in the veneer as necessary. Dr Pohl may ask you to return for a follow-up visit in a couple of weeks to check how your gums are responding to the presence of your veneer and to once again examine the veneer’s placement. Ready to get started? Call our office today.